WHEN I WAS A KID I saw travel as an opportunity for adventure and hedonism. It was a chance to try new things, to learn a bit about the world, to absorb a bit more life. But I did not travel with anything resembling a conscience. Travel was something that was earned through hard work -- it was a reward, it was something the world owed me. Then, when I was a senior in high school, I went to El Salvador and saw poverty for the first time. Shortly after that, I traveled to Brazil, South Africa, India, and China. I saw shanty towns and starving children. I saw horrors that had been hidden from me in the suburban United States. And I met people in all of these places who were still kind to me. I started questioning things I'd always taken for granted -- the idea that poor people were poor because they were lazy, the idea that people living in poverty were somehow fundamentally different from me -- and my life started to change. My experience isn't remotely unusual -- it's extremely common for travelers to leave one person and come back another. And a lot of the time, the people that come back end up changing the world. Here are four of them. Eric Blair was a middle class kid in turn-of-the-century England when his family decided he ought to go serve the Empire in Burma. Blair had an innate sense of fairness, and he began to chafe against the injustices of the imperial system. So he quit and became a writer. From there, he moved back and forth from London to Paris, living in abject squalor in order to better understand poverty. He wrote two influential books describing the life of the poor under the pen name George Orwell -- Down and Out in Paris and London and The Road to Wigan Pier. When Blair went to Spain to cover the Civil War, he put down his pen and picked up a gun. A lifelong socialist, Blair was appalled at the brutality and the propaganda of both the fascists and the Stalinists. This would influence his two greatest known works, Nineteen Eighty-Four and Animal Farm. His became the best known voice to speak out against totalitarianism in the 20th century, and his name is basically a catchphrase for anti-totalitarianism today. Who knows what we would have lost if he'd stayed at home? Ernesto Guevara was born into a relatively well-off family in the Argentine city of Rosario. He'd grown up in a left-leaning family, but he himself said that the period in which he became a revolutionary was when he and his friend Alberto Granado took a year to ride a motorcycle through South America. Along the way, he met the continent's outcasts, poor, and indigenous, and he came out of the journey totally changed. Guevara wrote about his experiences in the seminal travel book The Motorcycle Diaries. He became a leftist revolutionary, and eventually joined a group of anti-imperialist Cuban's led by Fidel Castro. "Che," as he became known (after a popular Argentinian word), would become Castro's right hand man, and would be a major force in converting the nationalist Cuban leader into a full-blown Marxist. Guevara's legacy is checkered at best -- his tactics were brutal, and he became a full-blown executioner when the revolutionaries took Havana. But his face became the face of 20th century rebellion, and the fact that he changed the world is unquestionable. Siddhartha Gautama's early life is the stuff of myth -- he was born around 2600 years ago into a life of luxury. He was a prince, and his father made sure that he was given every luxury imaginable, and was sheltered from even seeing any suffering. But when Siddhartha began traveling beyond the walls of the palace, he began to see suffering -- aging, disease, poverty, and death -- and he became convinced that material wealth wasn't the key to life. He renounced his birthright as king and he became a wandering monk. One day, while traveling, he sat down underneath a Bodhi tree and meditated until he became enlightened. After that, he was known as the Buddha -- "the Enlightened One." The religion founded around his teaching, Buddhism, is now the world's fourth largest faith. Malcolm Little was born into a poor family. His father was murdered by white supremacists when he was young, and Little was shifted around foster homes until he fell into a life of drugs and crime. After being arrested for a robbery, he was sent to jail, where he began to educate himself. He converted to the Nation of Islam, rejected his last name and replaced it with an X, and quickly became the most influential voice for black power in America. Malcolm X’s early teachings were controversial to say the least. He was a black nationalist, and did not believe in integration or cooperation between the races. He was an unflinching critic of white supremacy, and was often (with some good cause) accused of being a bigot towards white people himself. 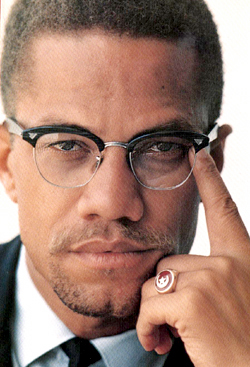 It wasn’t until he left the Nation of Islam and went on the hajj, the Muslim pilgrimage, that Malcolm X began to change. On the hajj, he saw people of all races cooperating and treating each other with dignity and respect. And he began to temper some of the anti-white rhetoric (while still furiously denouncing American racism). We unfortunately did not get to see enough of the man he would’ve become after this change — he was murdered by members of the Nation of Islam in 1965.